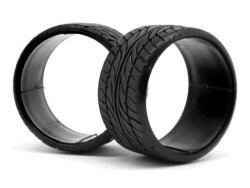 2 pieces Low Profile T-Drift Tire "Dunlop Le Mans LM703" for 1/10th touring cars. Extra-hard tread compound for drifting. The tyres are super-low profile to get the slammed look of the latest supercars and custom-tuned street machines. The tyre and wheel widths must match for correct fitting.